One of the joys of unschooling is the moment when your children ask about something that lets you bring out the resources you acquired a long time ago and have kept until your child’s natural interest was piqued. For me this week, it was play money. 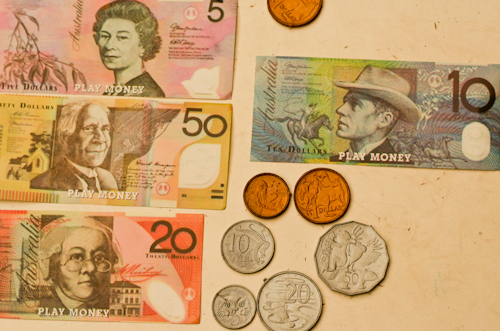 Several months ago, I spied some Australian play money in a shop. I bought it and put it away until “the time was right”. To give it to my children sooner would have robbed the educational toy of its true value. I have also invested in a couple non-breakable money boxes for the girls. Periodically, they ask to have one of them and they play with the box and the coins inside — sorting, personifying, reading the coins and examining the etchings. This gives them added familiarity with the money we use everyday. If I’m not deliberate with some of my actions, the girls don’t ever see money change hands. So I have started going to our bank’s atm, withdrawing cash and using it to pay for purchases. I can explain that the money gets into the atm because David has worked in the past and people have paid into his bank account, and the machine gives me the money when I insert my card and press the right buttons. To teach the fundamental concepts of currency, I deliberately take the girls with me when I go to the supermarket. We look at the prices of goods, and I explain how I am comparing the prices of similar items. I point out what is on special, the unit price analysis, and describe why I make my final choice. 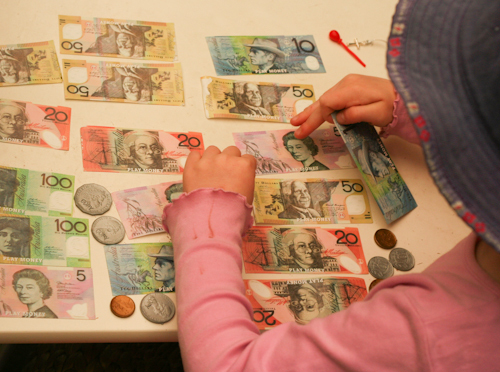 With smaller purchases (like at op shops), the girls often ask to pay, so I give them the money and tell them what change they should expect back from the shopkeeper. They have embraced this responsibility and love to participate in paying. David’s self-employment is a good basis for teaching how work leads to money. The girls know that David goes to work at other people’s houses for money, and if they break something — in order to replace it — David will need to work again. Because David isn’t working away from home every day, the girls feel a direct correlation (and are sorry for his absence) when David is gone. This has helped instil a sense of value into items like toys and food. Our commitment to homeschooling has also helped us to explain how we have made lifestyle choices — choosing to forego a new car or boat — so I don’t have to go to work. When the girls go past day-care centres, they understand that the children are placed there because the mothers are working, and hopefully they appreciate that I am home with them instead. All these conversations take place over days and weeks. There is never a time when I sit down with them and say, “Let’s talk about money.” David and I have discussed the possibilities of introducing pocket money, but until the girls are asking for their own money, we’re not going to bring it up. This week, I exchanged all my money and cards to a new purse. My previous one was wearing out, and I couldn’t risk having it break while I was out shopping. 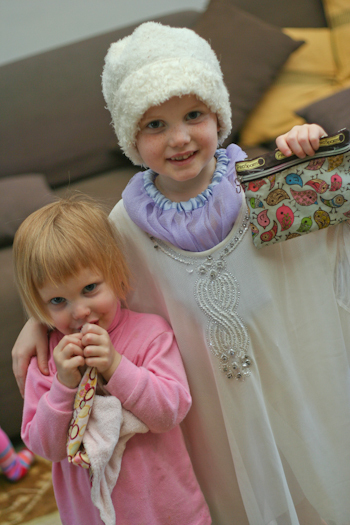 However, instead of throwing the old purse away, I gave it to the girls to add to their dress-ups box. Aisha was pretending to be "Mummy" with Calista acting as her daughter. Five-year-old Aisha was delighted with the purse and soon filled it with items that she knew I normally kept in it — receipts, tiny treasures, even a paint chip that I had hoarded in order to have it colour-matched. I was delighted to go to the cupboard and pull out the play money. We looked at each coin and denomination of notes. Aisha arranged all her money so she could have a good look at it. With this play money, Aisha and Brioni set up a shopkeeping game. Brioni collected a range of toys, put them on display and then Aisha would come along, select some and enquire the price. Brioni’s prices ranged from $1 to $30. If the girls couldn’t work out how to make the total amount, they would come to me and ask for help. It was a great opportunity to show how simple math concepts were useful in everyday life. When I left the room for a while, Aisha and Brioni agreed to keep the prices fixed at $5 because they knew how to pay that amount. It was a good lesson in money for both of them. I share these examples — not because these are exceptional — but because they are a natural, integrated way of teaching the concepts of money. You could print out pages with coins for your kids to colour in, but why not just let them handle the real thing? It’s freeing to know that your children will pursue learning when they are at the point of being interested. So trust them to do so, and watch them learn! Thanks for visiting, Diane! I hope you come back again soon. I have homeschooled for over 18 years! I loved every moment. Thanks! I do think it’s a lot harder for my oldest to understand money when all he sees is a card being swiped. I appreciate your insight on getting past that! Yes, Rosemary, real life is a great teacher! And homeschooling gives you the flexibility to fill in the gaps in your experiences/teachable moments where you need to! A lovely post. I really enjoy watching children learning through their own creative exploration. Clever find with the play money, mum!!!! Thank you for the visit to my blog. I’ll have to check out caves in Rockie, now. If it’s perfect for choirs, then in my books it’s a ‘must see’, lol!! I have exactly the same purse as the one you handed down to the girls. It came from Renee (of course) and I use it to keep my keys and phone in. I think it was meant to be for Brianna, but she has so many, and I love the design … Good to have you blogging again. I just can’t find the time to sit down and contribute to my own unfortunately!